Want more paleoart? Listen to Gabriel Ugueto on Science Friday and explore a visual guide of his illustration process. Learn how dinosaurs walked with Science Friday Educate, and see how puppeteers brought dinosaurs to life on stage. Paleoartist and scientific illustrator Gabriel Ugueto has a golden rule for his work: Accuracy. And he says that’s not to be confused with realism. As a paleoartist, Ugueto reconstructs and illustrates prehistoric animals that aren’t around anymore. You might see his work in books, museums, documentaries, or even scientific journals that deal with extinct animals. In order to resurrect the dinosaurs and other ancient creatures, Ugueto begins with a single bone and works his way from inside out. 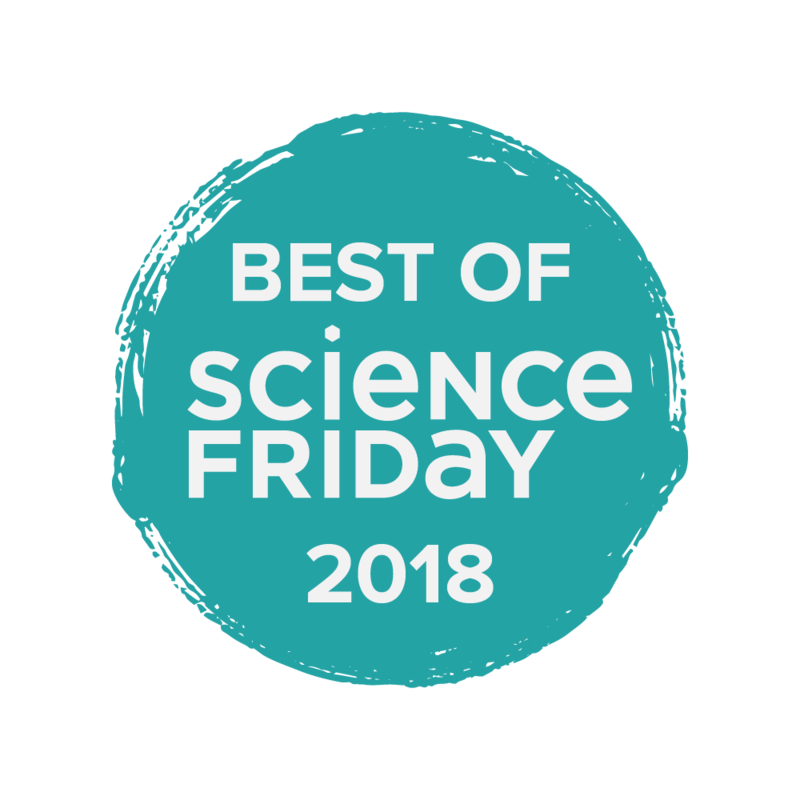 He researches whether there are any related animals alive today, or existing fossils that may shed light on how the bone fragment fits into a larger piece, and reconstructs the entire skeletal system. He then sketches in muscle groups, and adds skin and color considering where the animal lived and during what period of time. But his resulting illustrations often don’t match the Jurassic Park-inspired dinosaurs that we’re used to. Polycotylus. Image courtesy of Gabriel Ugueto. Until recently, Ugueto explains, people thought that plesiosaurs had smooth, taut skin. Then, researchers unearthed a “beautifully preserved” plesiosaur in Mexico. The finding revealed two new discoveries: Skin impressions revealing tiny scales, and blubber-like deposits around the body, particularly around the tail and neck. Geminiraptor. Image courtesy of Gabriel Ugueto. We may now know that birds are modern dinosaurs, but the feathers they sport go way back—and they didn’t always appear only on the dinos that flew. “We have evidence for many, many groups of non-avian dinosaurs that they had feathers,” says Ugueto. And these dinosaurs had plenty of different types of feathers, he explains, from very simple ones that look more like hair to the types of feathers that can be still found on birds like pigeons today. Tyrannosaurus rex. Image courtesy of Gabriel Ugueto. Perhaps the most commonly-depicted dinosaur, Tyrannosaurus rex is usually shown as a terrifying, glamorous, photogenic lizard. But in reality, the mighty T. rex was a bit scruffier around the edges than you’ve been lead to believe. “What I learned is that you have to be really careful how you reconstruct teeth,” says Ugueto. Like humans, dinosaurs periodically lost some teeth. But unlike humans, they grew new ones. Those perfectly aligned and filled sets of chompers that we may see in movies aren’t very accurate—Ugueto takes care to reconstruct dinosaurs with teeth in various stages of development. 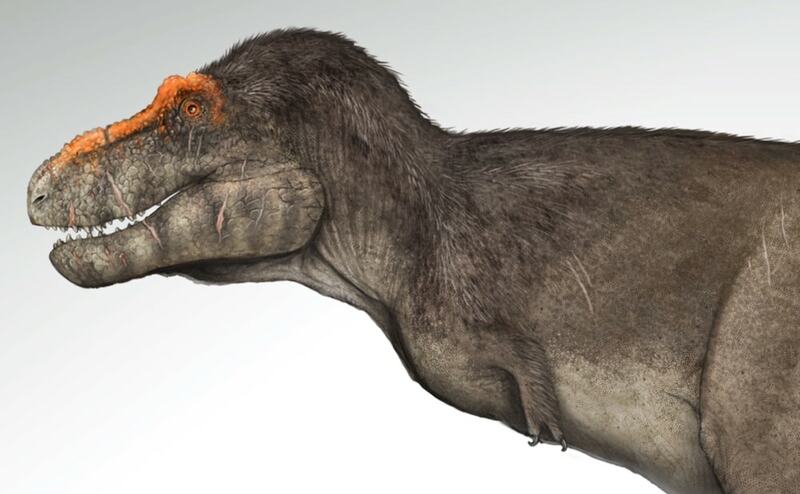 And if this T. rex looks a bit grizzled, that’s because it likely was. “It is known that tyrannosaurs had a very violent social life,” says Ugueto. “They bit each other’s face frequently, and they have a lot of scars in the fossils.” When illustrating their heads, Ugueto takes care to depict the scarring from all those scuffles. And finally, while tyrannosaurs were mostly scaly, that doesn’t meant that they didn’t have feathers on parts of their bodies, says Ugueto. Deinocheirus. Image courtesy of Gabriel Ugueto. When he’s not doing strictly paleontological work, Ugueto occasionally gets to flex his artistic muscles a little more, as in this illustration of an irritable deinocheirus, above. “If you’ve ever been around swans or geese or ducks, you know they’re super cranky,” says Ugueto. 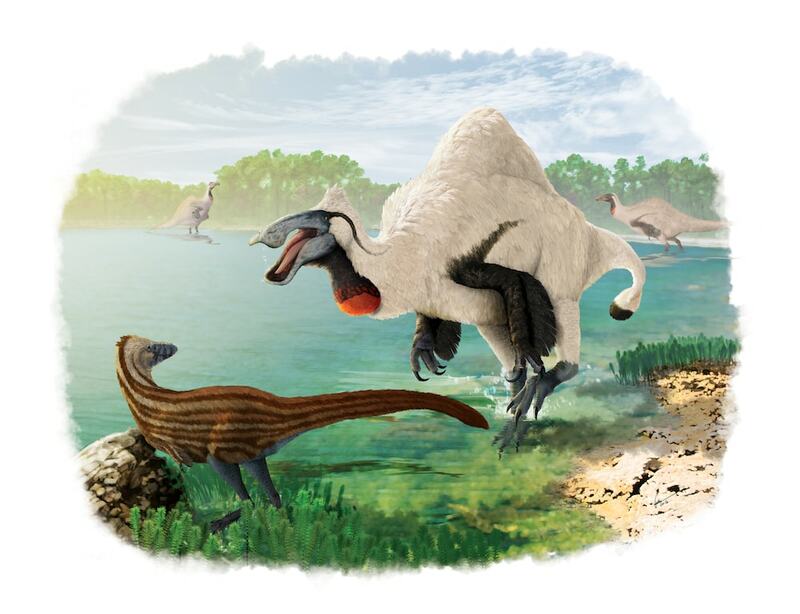 “And a lot of times too, I think dinosaurs were probably cranky also, only with a lot more teeth and a lot more attitude and a bigger size.” In fact, the deinocheirus depicted above was about the size of a T. rex. Agnur. Image courtesy of Gabriel Ugueto. Sometimes, Ugueto’s recreations seem almost too astonishing to be true. When he brought this illustration of the Anurognathus to the printer, he had an exchange with the woman behind the counter, who couldn’t believe that such an animal had once roamed the earth. Ugueto compares this pterosaur called Anurognathus, depicted above, to a porg from The Last Jedi. Ugueto says it’s easy for people to be surprised and amazed when they see his recreations. But the feeling goes both ways: “I think part of it is the rush of creating something that looks so bizarre, and it fuels your imagination to think, ‘What were they doing? How could they have behaved? What were those weird structures they had for?’” he muses. Even for a paleoartist, the creatures can be surprising and amazing. Correction 3/16/18: A previous version of this article implied that plesiosaurs and pterosaurs are dinosaurs. Plesiosaurs are marine reptiles, not dinosaurs, and pterosaurs, while closely related, are not dinosaurs either. We’ve clarified the language and regret the error. We used to know very little about animal anatomy. Now, a new imaging technology allows us to see things that were in front of us the whole time.